Hand Therapy is the art and science of rehabilitation of the upper limb, which includes the hand, wrist, elbow, and shoulder girdle. It is a specialization beyond OT and PT and it merges the two professions theory and practice that combines comprehensive knowledge of the structure of the upper limb with function and activity. A Certified Hand Therapist (CHT) is an occupational therapist or physical therapist who has a minimum of five years of clinical experience, including 4,000 hours or more in direct practice in hand therapy. The Certified Hand Therapist has to successfully pass a comprehensive test of advanced clinical skills and theory in upper quarter rehabilitation. 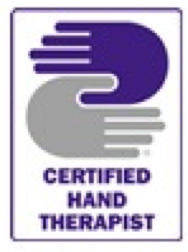 The Certified Hand Therapist credential offers assurance to the public that the therapist has achieved the highest level of competency in the profession and stays up to date with practice within the field. The CHT credential is recognized by many professional organizations as a benchmark for excellence in advanced specialty credentialing in health care.